This is going to be my new official “go to” dip for entertaining and parties. Except for the fact that I don’t do any type of entertaining or go to any parties! Unless family gatherings count? 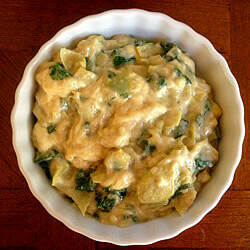 This amazing Vegan Kale and Artichoke Dip is a twist on the classic Spinach and Artichoke Dip recipe we have all had at one time or another. Maybe not in recent times, though, if you are vegan. The traditional Spinach and Artichoke Dip can contain cheese, cream cheese, Parmesan cheese, mayonnaise, butter, milk, pepperjack cheese and even crumbled feta cheese. But this vegan version is not lacking in creaminess or gooey cheesiness and I LOVE using the kale in place of the spinach! When I made this, I was in a hurry. I had just returned from the grocery store and was ready to head back out for another errand so I had less than a half an hour to make something quickly. I practically skimmed over the ingredient list and started throwing everything together. Even though I didn’t use all the ingredients the original recipe called for and didn’t even follow the directions on how to prepare it….it STILL came out awesome! I couldn’t imagine how much better it would taste if I would have made it correctly! Step 1 Break kale off stem and tear into small pieces. Drain the can of artichokes. Cut off the stem part. Cut each piece in half and dice into small pieces. Put all ingredients into an 8 x 8 glass dish and stir together until well combined. Bake at 350 degrees for 20 - 25 minutes or until cheese is melted and bubbly. Remove from oven and stir everything together again to make sure the melted cheese and all ingredients are evenly distributed before serving. (If you would like it with a little thicker consistency, just add another 1 - 2 tablespoons of non-GMO cornstarch). Do you have the original recipe?? I used it a while back and now cannot access it. It was a good one! It says “2tbs vegan (earth balance) ” I have no idea what that is! Vegan what? We don’t have the same brands here in Australia so would you mind clarifying what a vegan earth balance is? 🙂 thanks . Hi Emma! Sure, it should be 2 tbs of vegan butter. Any brand is fine, the Earth Balance brand is just the brand that I buy. I made the correction in the recipe…thanks for letting me know! Do you use the thicker coconut milk from a can, or the kind used for drinking in cartons? Thanks! Hi Maria! At the time I posted the recipe, I was using coconut milk in the carton as our non-dairy milk in our home, and which is what I used in this recipe. Since then, I have started making my own homemade almond milk, which is what I would use the next time I make this recipe. I would make some today to test it out, but we just at the last of our kale in salads for lunch lol. I’m sure any non-dairy milk would work fine but I’d like to make sure and actually make it with almond milk. If all is good, I will go and edit the recipe to say “1 1/2 cups of non-dairy milk”. I just haven’t tried it yet, but will. But to answer your question, in the recipe posted, I used coconut milk in the carton. I also notice in the original recipe source, it said to ~not~ use coconut milk in the can.